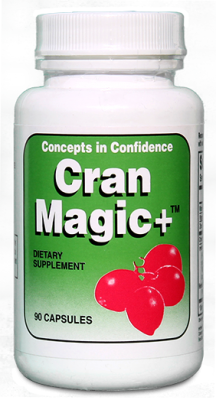 Cran Magic+™ is a natural Cranberry product that reduces urinary tract infections. Current research indicates that the components found in Cranberry are able to inhibit bacterial adherence to the cells of the urinary tract. Other ingredients include Antioxidant nutrients (Vitamin C, Vitamin E, Zinc), Parsley, FOS, Green Tea Extract, UVA, URSI. edmonton web design by device media l All Rights Reserved.